I've been on a sewing rampage lately, whipping up lots of easy projects. They are rewarding because it makes me feel like I actually accomplished something- the best kind of projects, right? When I got my new laptop for Christmas I knew i needed to get something to protect it. It was all shiny and new and I wanted to keep it that way. I could have gone out and bought a cover but I knew making one would be so much easier and cheap. Its easy to whip up these kinds of projects when you have a fabric hording problem like I do. 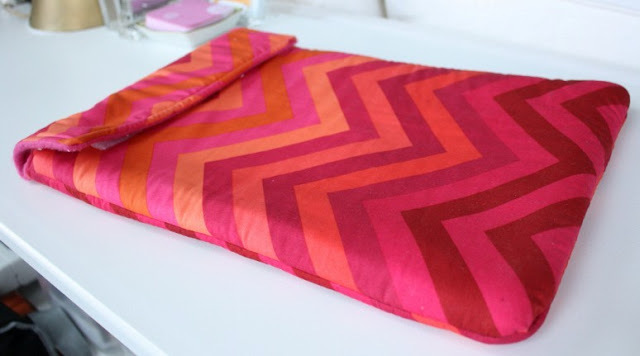 A little google search came up with this easy laptop case tutorial. If you know how to sew a straight line I swear you can make this too- its easy peasy! So cute! I love that fabric! It could double as a hot water bottle sac! I love the colors. You should sell these!! oh my goodness, this is SO cute! Learning to sew is definitely up there on my list of things to do this year!! and it has such character! it's beautiful. i wish that fabric was in my hoarder pile. this is WAY more cute than the case logic case my laptop lives in. I NEED to get my sewing machine out of its box asap! How cute is that! You are so good at sewing, obv! Have a great weekend! Too cute! Great fabric choice! I love the fabric! And you lined up the fabric so well - great job!! so pretty! I needed one of these a few weeks a go. A certain teenage boy... to remain unnamed, took my lovely silver mac to school and scratched the crap out of the top. Love this! Thanks for sharing. This is ADORABLE!! I wish I knew how to sew and had a sewing machine because I would try it out! oh my gawd. my heart skipped a beat when i saw that fabric...luuuuuv it! i need/want one. maybe a business idea??? hmm? So cute!! I might try this! when are you going to make these for us?!? theyd sell for sure...i bought one online on etsy that im sure took like 2 min to make, but i just cant sew if my life depended on it! Impressive AND adorable - quite a combination. What a lucky little laptop! This looks awesome! Might have to try making one now! It looks great! Once my laptop is fixed I will have to make one. I LOVE that fabric. So much fun. It looks amazing. I really need one of these. My poor laptop. oooo! so cute! wish i had one!